What is the difference between ‘for’ and ‘since’? What is the difference between ‘ever’ and ‘never’? What is the difference between ‘gone’ and ‘been’? subject + have/has + past participle. .
subject + have/has (n’t) + past participle. .
Have/Has (n’t) + subject + past participle.? Wh + have/has (n’t) + subject + past participle.? We use the present perfect for a past action but having the result at present. We use since to show point of time and for to show period of time can be used in present perfect especially with state verbs. We use ever in present perfect to ask about experience and achievements. Never is used in statements to mean not ever. 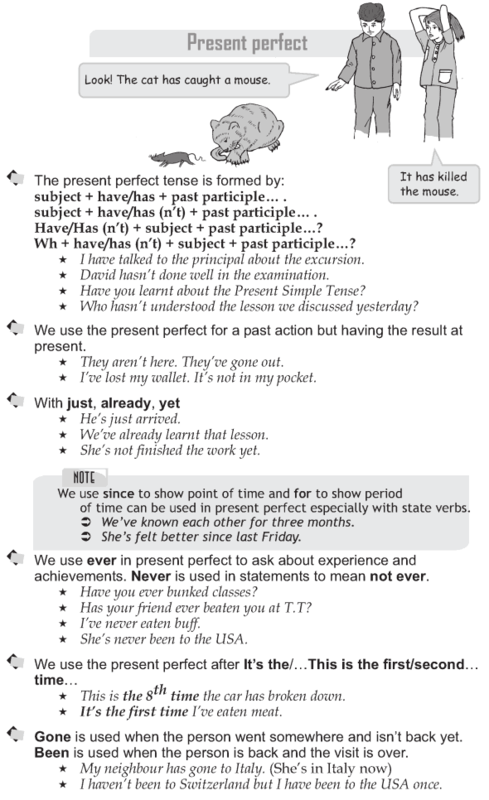 We use the present perfect after It’s the/.This is the first/second time. Been is used when the person is back and the visit is over. Gone is used when the person went somewhere and isn’t back yet.